A sign marks the way to a Vancouver civic election poll in this photo from Oct. 16, 2018. 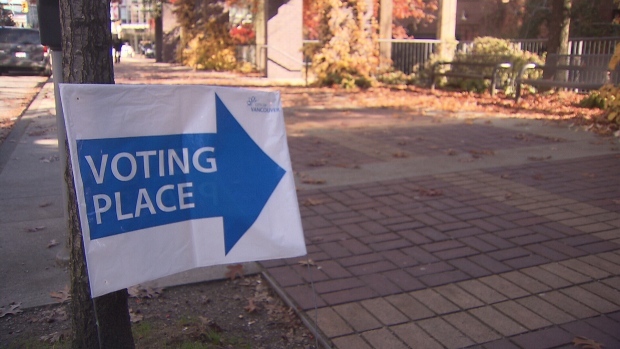 With just days until Vancouverites elect their new mayor, the number of undecided voters might actually be growing, a new poll suggests. A third of those surveyed by Research Co. between Oct. 12 and 14 reported being 'undecided' ahead of Saturday's election. In a similar study conducted just a week earlier, only 26 per cent of voters gave the same answer. "Many Vancouver voters are still making up their minds about the candidates and the parties they will support on Oct. 20," Research Co. president Mario Canseco said in a statement. "This group includes three-in-10 of those who vote for Kirk LaPointe in the last mayoral election and more than a quarter of those who cast a ballot for Gregor Robertson." Nearly twice as many women (43 per cent to 24 per cent) said they were undecided compared to male respondents. Uncertainty was also highest among those between the ages of 18 and 34, while other factors such as location and income did not appear to play a significant role when it came to this particular issue. According to the poll, Kennedy Stewart remains the favourite to win the mayor's chair with 36 per cent of decided voters reporting that have or intend to vote for the independent candidate. Support for the Non-Partisan Association's Ken Sim grew slightly since the previous Research Co. poll from 20 to 23 per cent. Independent Shauna Sylvester saw a similar increase in the polls from 16 to 19 per cent, while Yes Vancouver's Hector Bremner and Wai Young of Coalition Vancouver both slipped to six per cent in the most recent study. Research Co.'s results are based on a study conducted online between Oct. 12 and 14. According to polling company's website, 401 adult Vancouverites participated and the results carry a 4.9-per-cent margin of error, 19 times out of 20. Looking for more information, including voter resources, key issues, and an interactive map of who's running in each municipality? Check out our Election 2018 microsite.